In our environment, windows are introverted, shaded to keep out the sun, open to let in the breezes, but never closer than a regulatory six metres from a roadway, hiding what lies within from the casual pedestrian, not that the formal pedestrian would get a look in either. In suburbia here, pedestrian sightings are rare. From within, windows in Australia provide nothing more than an anonymous view of a distant world. From the outside they mostly serve merely as fenestration. In other places, they are more. In these places they are portals to a community which finds itself ambling within a few footsteps of the space within. They are a link between what goes on inside, and the world outside. They are close enough to allow the vouyeristically inclined a peep into the inner workings of someone else's life. Some have solid shutters firmly closed, leaving no doubt as to the attitude of the resident with regard to unwelcome intrusion. Some are open, laid bare, leaving nothing to the imagination. 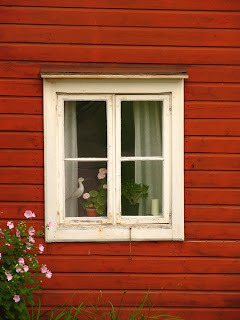 Others are framed with lace curtains, like the edge of a ladies petticoat barely visible below the hem of a skirt, maintaining modesty, yet leaving sufficient clues with regard to what lies beyond to engage a fertile mind for the seconds that it takes until the next window appears along the way. All of them lie quietly, waiting, ready to tell their story to an unsuspecting world.